In recent weeks, three Native American water protectors, each facing multiple federal felony charges and over a decade in prison, have accepted non-cooperating plea agreements rather than stand trial in North Dakota. Red Fawn Fallis, Michael “Rattler” Markus, and Michael “Little Feather” Giron are among the six people indicted for federal felonies—the harshest charges so far filed against participants in the monthslong struggle to stop the Dakota Access Pipeline (DAPL) from crossing the Missouri River just north of the Standing Rock Lakota’s reservation in North Dakota. All the federal felony charges stem from October 27, 2016—a day that would turn out to be decisive in the battle over the pipeline. In late October, as pipeline construction approached the Missouri River from the west, many pipeline opponents moved a mile north from the main Oceti Sakowin and Sacred Stone camps to a front line camp built directly in the pipeline’s path. There, they erected teepees and tents and prepared to dig in for the winter. The camp was sited on land known these days as the Cannonball Ranch, which Energy Transfer Partners, the company behind the DAPL, had purchased in September 2016. As the water protectors pointed out, however, the land had been reserved for the Lakota under the 1851 and 1868 Fort Laramie treaties. In the 1860s, the Lakota, led by the Oglala chief Red Cloud, fought a bitter war to stop white settlers from moving through their land. In 1868 the U.S. government capitulated and agreed to remove the forts along the Bozeman Trail. Only then did Red Cloud ride into Fort Laramie and sign the 1868 treaty, which closed the trail to white settlers and established the Great Sioux Reservation, a vast tract of land that comprised the entire western half of present-day South Dakota. The treaty also defined a massive “unceded Indian Territory,” which “no white person … shall be permitted to settle upon” or “without the consent of the Indians … to pass through….” The unceded territory contained large swaths of present-day Nebraska, Wyoming, Montana and North Dakota—including the land south of the Heart River and north of the Cannonball River where, in October 2016, the water protectors were camped in the path of the DAPL. A pincer of police closes in on the water protector camp built on unceded Indian land and in the path of the Dakota Access Pipeline on October 27, 2016. 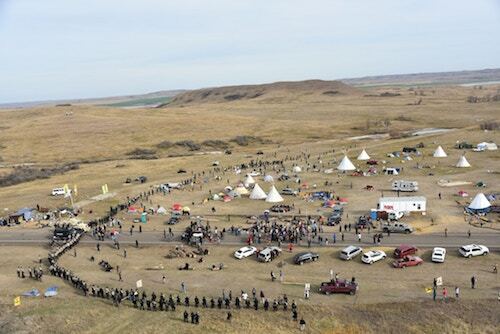 (Image: Law Enforcement Photo / The Intercept)"
At around noon on October 27, a hundreds-strong militarized police force approached the camp along Highway 1806 with plans to evict the Lakota and their allies—for trespassing. The force was heavily armored and armed with batons, beanbag shotguns, pepper spray and assault rifles, and supported by military humvees, snipers, APCs (Armored Personnel Carriers) mounted with LRADs (Long Range Acoustic Devices), and a surveillance helicopter. To the west, Dakota Access construction equipment and personnel could be seen at work on the pipeline route, ready to move on toward the river once police cleared the camp. As they moved south along the highway toward the camp, the police encountered an obstacle: pipeline opponents had constructed a roadblock from logs, tires, pallets, and disabled vehicles. As police advanced, blaring the LRAD, the barricades were set on fire. Miles away to the west, police travelling on County Road 134 also encountered a water protector roadblock. That barricade, too, was set ablaze in an attempt to slow the police advance and prevent them from flanking the 1806 roadblock and entering the camp. By night time, however, the police had cleared the camp. They had arrested more than 140 people and driven the others south along 1806 as far as Backwater Bridge. There, using the narrow bridge as a strategic chokepoint, they established a roadblock. Security forces set up a line of floodlights, razor wire, and surveillance points that stretched for miles along the pipeline route—a militarized buffer zone that, for months afterward, made it nearly impossible for water protectors to reach the construction site. Rattler, an Oglala Lakota man who grew up on the Pine Ridge Reservation in South Dakota, and Little Feather, a member of the Coastal Band of the Chumash Nation raised in Santa Barbara, Calif., were each charged in February 2017 with two federal felonies—Civil Disorder and Use of Fire to Commit a Federal Felony Offence—for their alleged actions to hinder police from clearing the frontline camp on October 27. In exchange for guilty pleas to the Civil Disorder charges, the prosecution has agreed to recommend 3 year sentences and drop entirely the Use of Fire charges, which carry a mandatory minimum penalty of 10 years in prison. Rattler and Littler Feather are scheduled to be sentenced on May 29 and May 30, respectively, in Bismarck, N.D.
Rattler and Little Feather decided to take plea deals rather than stand trial in part because they faced a hostile jury pool, according to press statements from the Water Protector Legal Collective. A study commissioned by the defense found that 77 percent of potential jurors in Morton County and 85 percent in Burleigh County had already decided that the defendants were guilty and that many have connections to law enforcement and the oil industry. This study was submitted to the court to support Little Feather’s motion for a change of venue, but the court denied the motion. Of the six federal felony defendants, Red Fawn, an Oglala Lakota woman from Denver, faces the most serious charges. In January 2017, a federal grand jury indicted her on three counts: Civil Disorder, Discharge of a Firearm in Relation to a Felony Crime of Violence, and Possession of a Firearm by a Convicted Felon—charges that carry a minimum sentence of 10 years and the possibility of life in prison. The arrest affidavit alleges that as security forces pushed water protectors south along 1806 on October 27, police “took Fallis to the ground” to arrest her for “being an instigator and acting disorderly.” The affidavit alleges that, while pinned face-down beneath the arresting officers, Red Fawn fired a gun into the dirt (the affidavit says the gun went off twice, but video of the incident appears to show three shots fired), injuring no one, and that police then wrested from her hand a Ruger .38 Special revolver. That gun, it turns out, belonged not to Red Fawn but to her boyfriend, Heath Harmon—a paid FBI infiltrator. In exchange for a plea of guilty to Civil Disorder and illegal firearm possession, the prosecution has agreed to recommend seven years in prison and drop the most serious Discharge of a Firearm charge. Red Fawn is scheduled to be sentenced on May 31, in Bismarck. The defense also argued that the prosecution was required to turn over any evidence that the violent acts on which the Civil Disorder charges were predicated were “influenced, encouraged, facilitated, or otherwise promoted” by people employed by federal, state or local law enforcement or by private security agents. The prosecution responded that none of the law enforcement agencies it contacted had any such evidence. They argued, however, that they were not compelled to search the records of the private security firms that collaborated closely with police during the DAPL protests, and Judge Hovland agreed. The District of North Dakota office of U.S. Attorney Christopher Myer, who is prosecuting the Red Fawn case, declined to comment for this story. Three other indigenous water protectors—Dion Ortiz, Brennan “Bravo One” Nastacio, and James “Angry Bird” White—still face federal felony charges of Civil Disorder and Use of Fire to Commit a Federal Felony Offense. If they do not take plea deals, they will face trial in the coming months. In addition to the federal felony cases, 832 people were arrested and charged in North Dakota state criminal court during the 11-month struggle against the DAPL. Of those cases, 332 have so far been dismissed or acquitted at trial, and 314 are on-going. Joseph Bullington is a reporter and a Rural America In These Times intern who grew up in White Sulphur Springs, Mont. Standing Rock Spawned a Generation of Water Protectors. Now They’re on the Move. So, do you plan on seeing to it that the FBI is incriminated? That would be justice. Meanwhile, the Bundys had all their charges dropped after actually firing weapons at federal agents. but the Bundys are white cattle ranchers who had been refusing the pay fees for ranching on public land- millions of dollars in fees accrued over decades from what I've heard. All this is pure racism with a bunch of damned white supremecists running the show. Justice continues to not be meted out fairly if you aren't white. "That gun, it turns out, belonged not to Red Fawn but to her boyfriend, Heath Harmon—a paid FBI infiltrator." "Civil Disorder, Discharge of a Firearm in Relation to a Felony Crime of Violence, and Possession of a Firearm by a Convicted Felon..."
If ya can't do the time, don't do the crime!